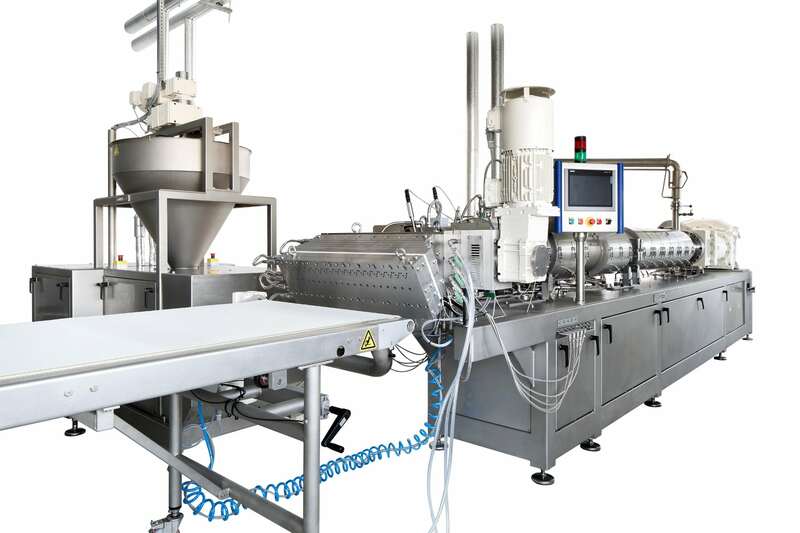 The cooking extruder can be fitted with a screen changer, which prevents solid particles from entering and subsequently clogging the die. Screen changers are essential, since without one, products can suffer a severe loss of quality. Additionally, the screen changer is fitted with a start-up valve. This valve regulates the machines pressure buildup and provides additional safety measures. Before putting the extruded product on the belt, the screen changer can be locked in the central position. This is the position without a screen. As a result, the mass will be diverted downwards and can then be checked easily for texture and consistency, after which it can be easily reworked. Finally, this central position is a quick and secure way to prevent equipment within the line from breaking, and as a result, reduces overall downtime. result.